A counter response to THE ISRAEL LOBBY and U. S. Foreign Policy. Sponsored by the Berkeley Teach in Against the War [Irag War] Mearsheimer and Walt, the authors of The Israel Lobby and US Foreign Policy, presented to a general campus audience from the UC Boalt Law School. SFI had little time to organize itself as it was still being pulled together. Approximately 15 students dressed in dressed attire and handed out brochures documenting the inaccuracies and rascist elements in the book authored by these two speakers. The students prepared a list of questions for the speakers as well. Initiated, organized and led the successful bill passed by the Associated Students of the University of California (ASUC) endorsing the Israel-USA relationship. This would have been unheard of on the UC campus previously. The resolution, which affirms the need for and importance of the Israel-USA relationship, expresses the similarities between the ideals and beliefs of the two countries. Contrary to many expectations, the resolution passed, marking a change on the UC Berkeley campus. Organized and co-sponsored Israel 360 - a dynamic multi-media presentation about Israel from A-Z. The event was targeted at the mainly Jewish audience and was held on campus. It engaged students who know very little about Israel by highlighting exciting components of Israeli history, geography, and culture. In addition to providing a lot of information, Israel 360 showed students that Israel is a unique and inspiring place that must be visited." The event drew over 100 students, including gentile ASUC senators and other campus leaders. Placed two ads in - The Daily Cal – on Martin Luther King’s birthday holiday, quoting the Reverand’s impassioned endorsement of Israel. The Daily Cal is the student run newspaper and having a daily circulation exceeding 60,000. Dr. King’s endorsement of the Jewish State is important for the students at Berkeley to hear since they place such a high priority on diversity. Organized a dinner for student leaders with Ishmael Khaldi (Israeli Deputy Consul). Mr. Ishmael Khaldi spoke about diversity and minority rights in Israel and drew upon his various experiences as a Bedouin. Among the 45 people attending the dinner were leaders of Cal Coptics, Berkeley College Republicans, Unitarian Universalist Campus Ministry, Society for Middle Eastern Culture and Current Affairs, and other student groups. The Muslim student school senator also attended. After a brief talk about the good treatment of minorities in Israel and other similar issues, he answered questions from the audience, addressed students’ concerns and clarified misconceptions about Israel. Organized Israeli Peace & Diversity Week, in response to Israel Apartheid Week arranged by a coalition of anti-Israel organizations – including the Muslim Students Association and Students for Justice in Palestine. Screened the movie on campus - The Road to Jenin which debunks, with facts, the lies perpetrated by the Palestinian Authority about a ‘massacre’ which they claim, but in fact did not, occur in this West Bank town. The movie illustrates ethical aspects of the IDF in its operations. Organized & co-sponsored, together with the San Francisco JCRC, the film Making of a Martyr presented by the filmmaker and director Brooke Goldstein The film revealed the gross violation of human rights of Palestinian children by the Palestinian terrorist organizations transforming children into suicide bombers and placing the value of death over life throughout Palestinian society. Organized the Israeli Peace and Diversity demonstration held on Sproul Plaza which had more people in attendance than the, anti-Israel, Israel Apartheid Week demonstration. The protest was the largest and most successful pro-Israel demonstration the UC Berkeley campus has witnessed in many years. Comments from participants were to the effect that this was the “proudest moment they had being a Jewish student at CAL since they arrived”. It served as a counter rally to the Students for Justice in Palestine’s Israel Apartheid Week Rally. Organized and created "15 Seconds," a rally in support of residents of Sderot living under incessant, daily barrages of rockets. The event was held in front of the main campus plaza and incorporated letters, poetry, and theatrics, which were taken note of by students coming in and out of classes. Every couple of minutes, the Color Red alarm was broadcasted over speakers for students to understand the distress and torture that residents of Sderot endure daily. Organized the campus rally Path to Peace, – held at Sather Gate on behalf of how Israel has been striving and struggling for peace since the inception of the State. The rally presented students with a flyer, revealing the various times Israel has sought peace, and a white daisy. Hosted and organized the speaker Stanley Urman on the subject The Forgotten Refugees. 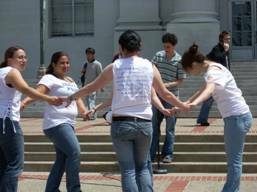 The event was held on campus and co-sponsored, together with the San Francisco JCRC and JIMENA. Mr. Urman is the Executive Director of Justice for Jews from Arab Countries. In addition to Mr. Urman’s talk the students screened the movie The Forgotten Refugees: Jewish Refugees from Arab Countries. Approximately 60 people attended the event. Organized and hosted on campus Mr. Ido Aharoni speaking on The New Image of Israel: Is Peace in the Future? The event was co-sponsored with Caravan for Democracy – JNF. Mr. Aharoni is the Israel Ministry of Foreign Affairs He delivered a very engaging talk about the branding and marketing of Israel in the United States. Although many Americans may support Israel, it does not mean that they can necessarily relate to Israel or understand the true nature of the country. The presentation opened the eyes of many students to the importance of spreading the word about the true, multifaceted image of Israel. Approximately 80 students attended the event. Co sponsored with Israel Action Committee appearance of Aryeh Green, of the Jerusalem Media center. Like most of the IAC’s events it was held in Hillel. Organized and presented "Save Sderot!" featuring Photojournalist Noam Bedein, the director of the Sderot Media Center. The plight of Sderot and other constantly bombed and attacked Israeli towns of the Western Negev both to Israel and the world Was presented. The event was co-sponsored by: The Zionist Organization of America, JCRC, IPI, Tikvah Students for Israel, Chabad at Berkeley, Alpha Epsilon Pi Fraternity, Berkeley College Republicans, and Congregation Netivot Shalom. Organized and led ceremony commemorating Yom HaShoah - Holocaust Remembrance Day. In the absence of any organized activity from the Jewish Student Board or Hillel, Tikvah organized at the last moment a solemn ceremony on Sproul Plaza. Poems were read, banners were held, holocaust victims’ names were read to students passing by. Hosted and presented Dennis Prager, speaking on Why Berkeley Should Be Celebrating Israel’s 60th Birthday. Dennis Prager is one of America's most respected radio talk show hosts. He has written numerous books, including Happiness Is A Serious Problem, Think A Second Time, The Nine Questions People Ask About Judaism, and Why the Jews ? The Reason for Anti-Semitism, regarded by many as the most persuasive explanation of anti-Semitism written. Dennis Prager's talk at UC Berkeley was a successful start to "Israel at 60 Week, organized by Tikvah. Some 250 people, both students and community members, filled the lecture hall. The event was co -sponsored by: CAMERA, Israel @ 60, and the Israel Peace Initiative (IPI). 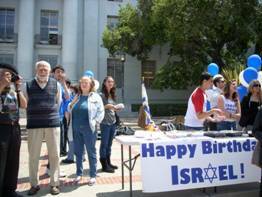 Celebrating Israel’s 60th Independence Day, Tikvah-SFI students organized a celebration on Sproul Plaza with Israel Folk Dancers, music, dancing, balloons, banners and more They arranged to have the Israeli national anthem - HaTikvah played on on the Campanile at the UC Berkeley campus. Members of the University of California Marching Band also played Hatikvah during the noon rally. Below is a YouTube video of it. It rings 12 times for noon and then goes into HaTikvah.